Hotel Cozumel & Resort is a three story Mexican style building featuring the largest swimming pool in Cozumel. It is within walking distance to the gorgeous down town of Cozumel and the shopping area and night entertainment. Hotel Cozumel & Resort is the perfect choice for a family vacation as well as for those who love diving and adventure. Wedding & Honeymoon packages available. 181 air conditioned standard room with one king or two double beds, satellite TV, direct dial telephone, coffee maker, radio/alarm-clock, safety deposit box, iron and ironing board. Bathroom is equipped with shower and bathtub, hairdryer and toiletries. 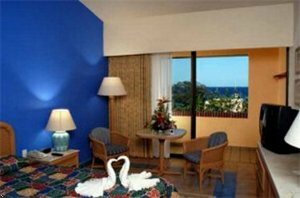 All rooms with private balcony and most of them overlook the largest swimming pool in Cozumel. Occupancy: 3 adults or 2 adults + 2 children under 12 years old. Hotel Cozumel & Resort was recently recognized by "Check-Safety-First" (Hotels that care about your health) as one of the three hotels in Cozumel that has proved its capability to prevent food borne illness. Hotel Cozumel & Resort has been subject to monthly rigorous inspections for food safety and hygiene. Other aspects such as fire safety, hurricane preparedness, ethical operation, sustainable tourism and others were also inspected. Today Hotel Cozumel & Resort proudly holds the "Cristal" certification by Check-Safety-First (for further information refers to: www.checksafetyfirst.com). Standard guest room with king bed or 2 double beds. Room includes satellite TV with remote control, private bathroom with amenities, balcony, and ceiling fan. 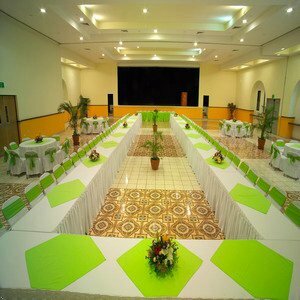 Hotel Cozumel & Resort is a three story Mexican style building featuring different types of accommodation for your comfort. 174 air conditioned standard room with one king or two double beds, satellite TV, direct dial telephone, coffee maker, radio/alarm-clock, safety deposit box, iron and ironing board. Bathroom is provided with shower and bathtub, hairdryer and toiletries. All rooms with private balcony and most of them overlook the largest swimming pool in Cozumel. Occupancy: 3 adults or 2 adults + 2 children under 12 years old. Hotel Cozumel is located just 10 minutes from the Airport. From the Airport take the only one Exit to the Antonio Gonzalez Ave. (formerly the Airport Blvd). Make a right. Head towards west until reaching the waterfront main Ave. (Rafael E. Melgar Ave.) Make a left. Head towards south 3 more miles. Hotel Cozumel is located on the left side. It serves snacks and beverages in a relaxing atmosphere by the largest pool of Cozumel. Hours service: 11:00 am - 5:00 pm. Enjoy an extraordinary ocean view during the lunch; this restaurant is open from 12:00 pm -4:00 pm. Serving buffet style.